Cyclical tailwinds provide the perfect opportunity for industry leaders to shine. This firm has effectively taken market share from competition while improving its profitability. Add a shareholder-friendly executive compensation plan, and we believe the firm will continue to outperform. NVR Inc. (NVR: $2,112/share) is this week’s Long Idea. Since 2011, NVR has grown after-tax profit (NOPAT) by 26% compounded annually to $440 million in 2016. Per Figure 1, the company’s NOPAT margin has improved from 5% to 8% over the same time. Longer-term, NVR has grown NOPAT by 10% compounded annually since 1998, the earliest year in our model. In addition to NOPAT growth, NVR has generated a cumulative $821 million (10% of market cap) in free cash flow (FCF) over the past five years. Throughout the company’s history, including the 2008 economic recession and its fallout, NVR has earned a double-digit return on invested capital (ROIC). NVR currently earns a top-quintile 21% ROIC. NVR’s executive compensation plan includes base salary, annual bonuses, and long-term stock-based compensation. 50% of long-term stock options are tied to the firm’s return on capital performance. Additionally, for performance-based options, vesting is subject to NVR’s return on capital relative to its peer group. Return on capital has been part of NVR’s executive compensation plan since 2014 and is one of the reasons the stock is on April’s Exec Comp Aligned With ROIC Model Portfolio. The focus on return on capital helps ensure executives continue to be good stewards of capital. Per Figure 2, NVR’s ROIC has improved from 12% in 2011 to its current 21%. More importantly, NVR has grown economic earnings from $88 million in 2011 to $352 million in 2016, or 32% compounded annually. We know from Figure 3 below, and numerous case studies, that ROIC is directly correlated to changes in shareholder value. NVR’s use of return on capital to measure performance ensures executives’ interests are aligned with shareholders’ interests. Per Figure 3, ROIC explains 75% of the changes in valuation for the 16 homebuilders we cover. Despite NVR’s 21% ROIC, well above the 7% average of the peer group, the firm’s stock trades at a slight discount to peers as shown by its position below the trend line in Figure 3. If the stock were to trade at parity with its peers, it would be at $2,178/share – 3% above the current stock price. Given the firm’s consistent and much higher ROIC, improving profitability, and shareholder-friendly executive compensation plan, one would think the stock would do better than just trade at parity and would garner a premium valuation. In the homebuilding market, builders have numerous tools to entice buyers, such as price breaks, upgrade packages, and even financing deals for using a preferred vendor. These incentives can destroy margins if overused. Per Figure 4, NVR has the top ROIC and one of the highest NOPAT margins versus peers, which include Lennar Corporation (LEN), PulteGroup (PHM), Toll Brothers (TOL), D.R. Horton (DHI), and Meritage Homes (MTH). High margins allowed NVR to remain profitable after the housing bubble burst and grow profits as the market improved. Additionally, NVR’s profitability gives it greater ability to pressure competitors and offer more value (through lower prices or more features) while remaining profitable. Lower margin competitors must choose between giving up the business, matching NVR and taking a lower margin, or offering a lower quality product to maintain margins. Since the housing collapse in 2006-2008, the housing market has seen growth in both new home and existing home sales. Bears will argue that the market is once again peaking and cannot support greater sales growth. We wrongly argued in 2015 that the housing market might have reached a top in terms of prices and sales. In fact, current trends, including new home sales and inventory of available homes, are creating tailwinds for NVR that should not be overlooked. Any bear case against NVR ignores these tailwinds, and NVR’s ability to effectively capitalize on the housing rebound. Figure 5 shows that annual new home sales remain well below the average of any 10-year period since the 1960’s. Even 2016 sales of 559 thousand remain 20% below the 30-year average. While the housing market has posted impressive growth since the bubble burst, it has yet to reach even pre-bubble levels. While new home sales remain below average, the existing supply of homes is falling as well. Since 2011, existing inventory of homes for sale has fallen from nearly 3 million to below 1.7 million in December 2016, the lowest supply level since 1999. Low inventory of existing homes provides an opportunity for homebuilders to attract customers. Per Figure 6, new home sales as a percentage of home sales has grown from 6% in 2010, to 11% in 2017. However, the percentage of new homes sales remains well below the pre-recession average of 24%. NVR has leveraged these trends, along with five consecutive years of rising average sales prices to grow its market share. In 2006, NVR held a 3% market share, based on total closings. NVR doubled its market share, to 6% in 2016, at the expense of competitors such as PulteGroup, KB Home, and Beazer Homes, all of which lost market share over the same time. Bears will also argue that rising interest rates will have a negative impact on the industry as rising mortgage rates make homes less affordable. Preliminary sales data shows otherwise. The average 30-year fixed rate mortgage, as of April 12, was 4.2%, up from the 3.65% average in 2016. Nevertheless, new home sales in 2017 rose 6% and 13% year-over-year (YoY) in January and February respectively. Also in February, applications to build rose to the strongest level since September of 2007. In March, mortgage applications for new homes rose nearly 7% YoY to the highest level since the Mortgage Bankers Association began tracking the data in 2012. Despite rising rates, demand for housing has not fallen. Lastly, NVR’s valuation also undermines any bear argument. Despite rising sales, impressive NOPAT growth, economic tailwinds, NVR’s current valuation implies permanent profit decline, as we’ll show below. The market has rewarded NVR for its consistent profit growth and the stock is up over 170% over the past five years, while the S&P 500 is up 70%. Despite the price appreciation, NVR is still undervalued. At its current price of $2,112/share, NVR has a price-to-economic book value (PEBV) ratio of 0.9. This ratio means the market expects NVR’s NOPAT to permanently decline by 10%. This expectation seems rather pessimistic for a firm that has grown NOPAT by 10% compounded annually since 1998 and is taking market share from competitors. Even if NVR were to never again grow profits from current levels, the economic book value, or no growth value of the firm is $2,363/share – a 12% upside from current valuation. However, if NVR can maintain 7% NOPAT margins (average of last five years, compared to 2016 margins of 8%) and grow NOPAT by 8% compounded annually for the next five years, the stock is worth $3,406/share today – a 61% upside. This scenario assumes NVR can grow revenue by consensus estimates in 2017 (14%) and 2018 (11%), and 8% each year thereafter. For reference, NVR has grown revenue by 17% compounded annually over the past five years and 8% compounded annually since 1998. With housing supply constraints causing buyers to choose new construction, NVR could easily meet or surpass these expectations. Add in the possible 6% repurchase yield and its clear why NVR could be an excellent portfolio addition. In 2016, NVR repurchased over $455 million worth of stock, up from $431 million in 2015. At the end of 2016, the company had $184 million remaining under its current authorization and in February 2017, the firm approved an additional $300 million repurchase authorization. Going forward, if NVR were to average its 2015 and 2016 repurchase activity, the remaining authorization will last just over one year, and the firm would repurchase a total of $443 million this year. A repurchase of this size is 5.7% of the current market cap. While NVR pays no dividends, its repurchase activity offers investors a potential yield of nearly 6%. In 2016, NVR derived 57% of revenues from its Mid Atlantic region, which consists of Maryland, Virginia, West Virginia, Delaware, and Washington D.C. Within this region, 30% and 13% of homebuilding revenues came from Washington, D.C. and Baltimore, MD respectively. These regions present strong growth opportunities moving forward. In January, February, and March, the Washington D.C. area has posted year-over-year sales growth of 21%, 16%, and 19% respectively. Maryland on the other hand has posted year-over-year sales growth of 7%, 0.3%, and 19% in the first three months of 2017 respectively. With strong regional growth in the face of rising interest rates, NVR is poised to capitalize and grow both the top and bottom lines. Beating both top and bottom line expectations could be the catalyst that pushes the stock higher. When NVR reported 4Q15 results above consensus, the stock rose 6% over the next four days. In 4Q16, when NVR beat both top and bottom line consensus estimates, the stock rose 12% in the following two days. With rising new home sales, strong regional growth, and executives aligned with shareholders’, NVR could be poised for another beat and subsequent increase in valuation. In the meantime, investors in this stock carry very low valuation risk and are rewarded with a potential 5.7% yield given NVR’s history of share repurchases. Over the past 12 months, there have been no insider shares purchased and 27 thousand insiders shares sold. These sales represent 1% of shares outstanding. Additionally, short interest sits at 57 thousand shares, or 2% of shares outstanding. Income Statement: we made $44 million of adjustments, with a net effect of removing $14 million in non-operating expense (<1% of revenue). We removed $15 million in non-operating income and $29 million in non-operating expenses. 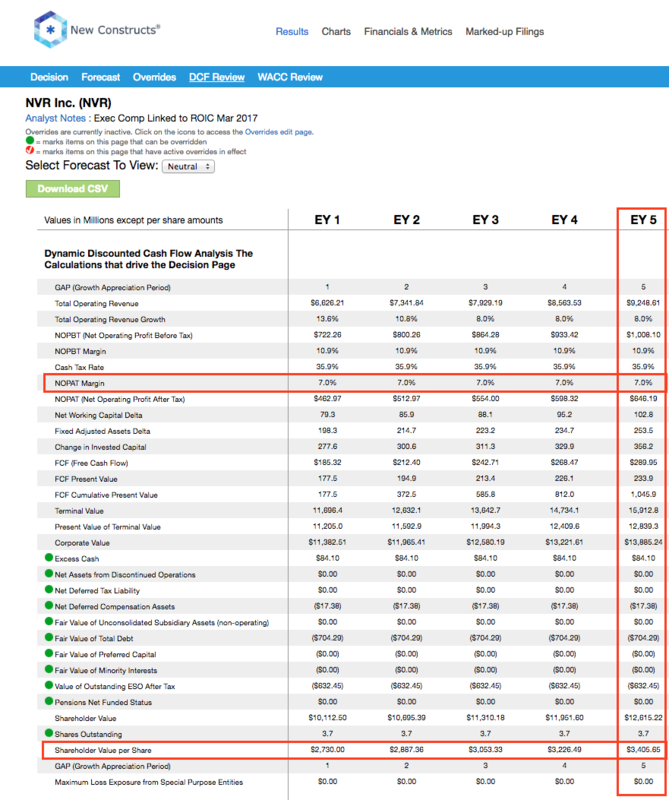 You can see all the adjustments made to NVR’s income statement here. Balance Sheet: we made $1.4 billion of adjustments to calculate invested capital with a net increase of $770 million. The largest adjustment was $390 million due to asset write-downs. This adjustment represented 30% of reported net assets. You can see all the adjustments made to NVR’s balance sheet here. Valuation: we made $1.4 billion of adjustments with a net effect of decreasing shareholder value by $1.3 billion. Apart from total debt, which includes $92 million in operating leases, one of the notable adjustments was $632 million in outstanding employee stock options. This option adjustment represents 8% of NVR’s market cap. Despite the net decrease in shareholder value, NVR remains undervalued. The following funds receive our Attractive-or-better rating and allocate significantly to NVR. 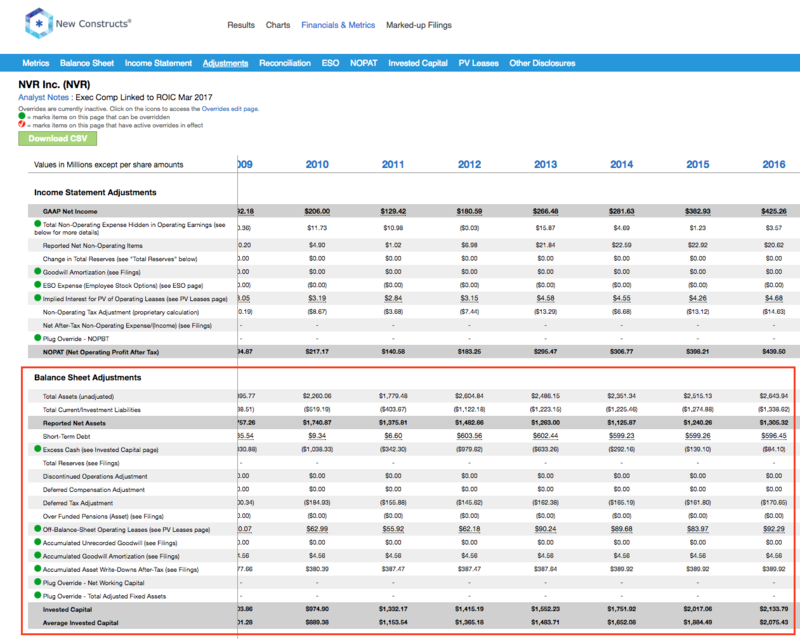 ValueShares U.S. Quantitative Value (QVAL) – 3.0% allocation and Very Attractive rating. RMB Investors Trust Fund (RMBGX) – 2.6% allocation and Attractive rating. John Hancock Fundamental Large Cap Value (JFVCX) – 2.5% allocation and Attractive rating. This article originally published on April 17, 2017. 2 replies to "The Market Undervalues This Firm’s Cash Flows"
I have TD Ameritrade accounts. Since they acquired Scott trade can I get the discount? If yes – I will purchase. We are not yet integrated with TD – we expect that to come after the official close of the acquisition at the latest.